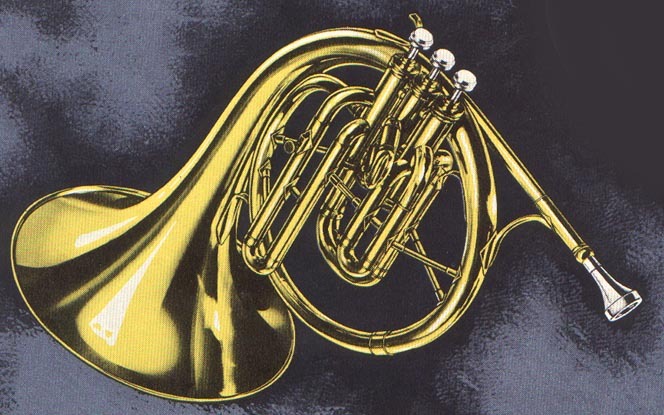 For a history of the mellophone, see this article on Al's Middle Brass Pages. To see pictures of Don Elliott with mellophones, organized by type, click here. 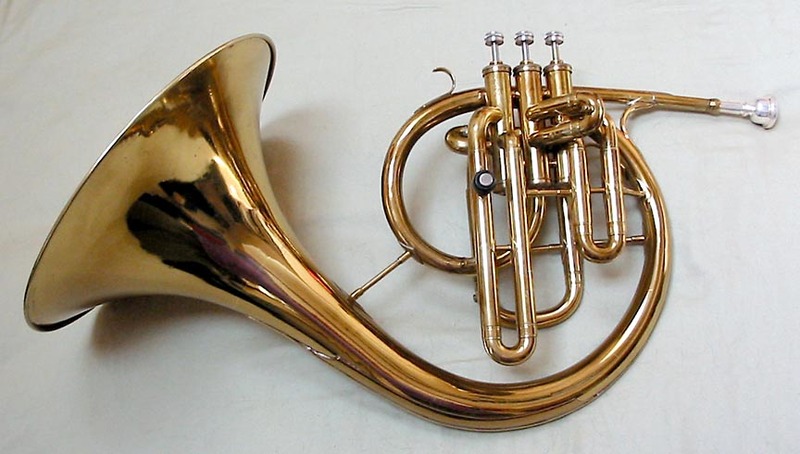 The mellophone is a brass instrument that, although usually pitched in F and often looking somewhat like a French horn, has little else in common with that instrument. The mellophone has an octave less tubing but approximately the same range because the French horn plays on its higher partials. It is also smaller and is played with the right hand. Paul Gaspar, a trumpet player in the Rochester area, describes the mellophone's sound as a cross between a trombone and a flügelhorn. Indeed, an unaccustomed listener could easily confuse it for a trombone. The circular mellophone, also known as the classic or concert mellophone (source), was the original shape of the instrument but is rarely seen today. Although used classic mellophones can be found on eBay, they are no longer manufactured in quantity. It's an interesting story how I got that horn. I'm still not entirely convinced that it is one of the three that Don used. A couple years ago, my friend Mark Metzler, a great repairman in Elkhart, Indiana, sent out a picture to several of us collector friends, asking "anyone have any idea what this is, and whether it's original or a Frankenhorn?" Apparently, an estate picker had brought it in for repairs and was looking to sell it. Well, I immediately recognized it as one of Don's custom Conn mellos because I'd played a jam session with him in the '70s. I immediately asked Mark to try to get it for me; he traded the picker some repair work for the horn, and I traded Mark a rare bicycle bugle he wanted, for the mello. The picker said he got it at a surplus auction from the Detroit MI city school system. I have no idea how the Detroit schools would get one of Don's mellos, so I think it was Conn's shop model, and that some employee rescued it when Conn was bought out by McMillan. McMillan threw away all the old shop models (prototypes) and all the historic company records, but employees saved a lot of it from the landfill and took stuff home. This might have been the original prototype and not one of the three that went to Don. It could have been donated to the Detriot schools by the former Conn employee. But this is all conjecture--the one thing for sure is that it is one of at least three that were built at the request of Elliott. 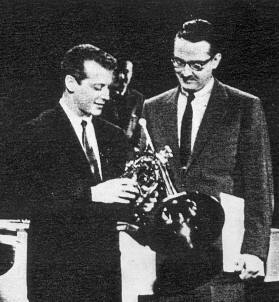 After making Don's custom mellophone, Conn invented the 16E mellophonium for Stan Kenton's band, and other companies imitated it. Don promoted the Conn 16E on the Steve Allen Show and in Conn advertisements. Today, the most common type of mellophone is the marching mellophone, which is used, of course, by marching bands. 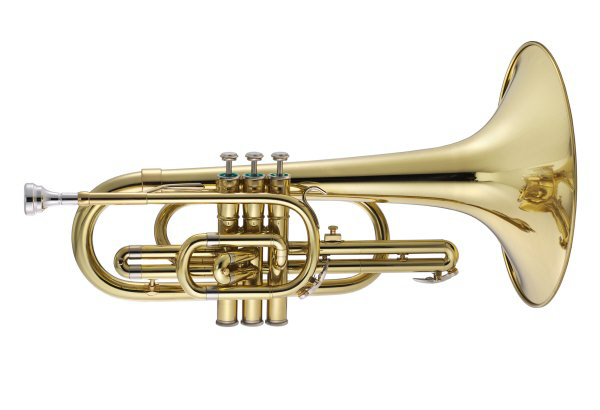 Unlike older mellophones, which have cornet-sized mouthpiece receivers, it has a trumpet-sized mouthpiece receiver .